Everyday ingredients, super delicious results. If you're still umming and ahhing about what to make this Christmas and haven't yet got everything (or anything) sorted, don't worry, you're not alone. Whipping up a festive feast can be painstakingly complicated and difficult, but it certainly doesn't have to be. The secret is having a few easy, impressive recipes up your sleeve. 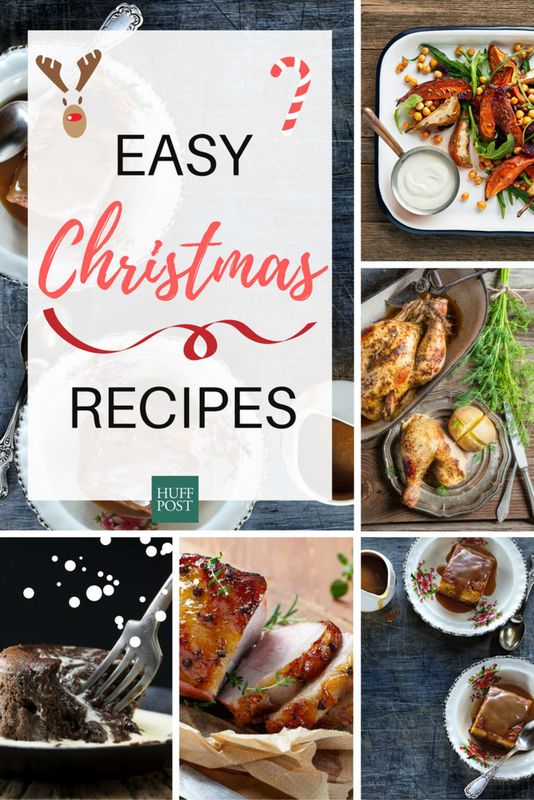 These Christmas recipes are simple and use everyday ingredients, yet don't sacrifice on flavour -- because a 20-step recipe right now just isn't happening. Preparation time: 15 minutes (not including chickpea preparation and cooking time). Cooking time: one hour and 10 minutes. Pat chickpeas dry with paper towel and place on an oven tray. Drizzle one tablespoon of the oil over the chickpeas and sprinkle with half of the fennel seeds and rosemary. Bake for 20 minutes, stirring occasionally or until chickpeas are golden and crisp. Reduce oven to 180ºC. 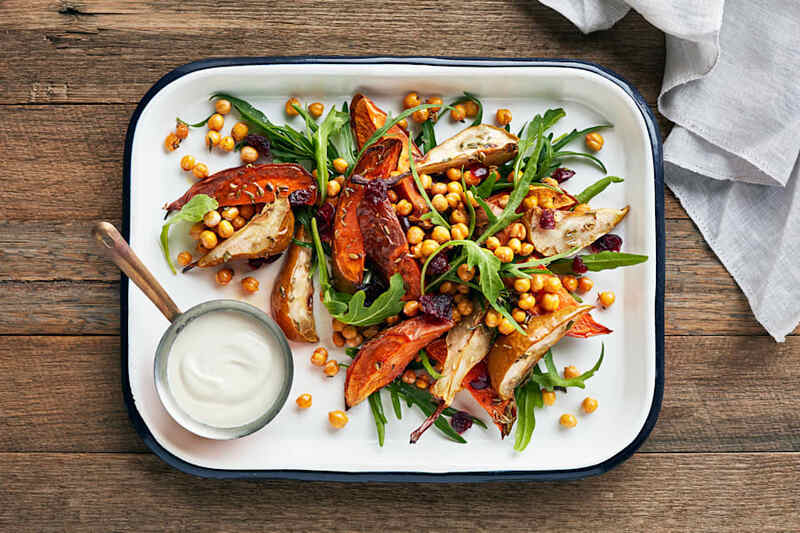 Combine sweet potato and pears on a large oven tray with remaining oil, fennel and rosemary. Bake for 40 minutes or until browned and tender. Meanwhile, soak cranberries in the boiling water for 10 minutes or until softened. Drain, reserving two tablespoons of the soaking liquid. 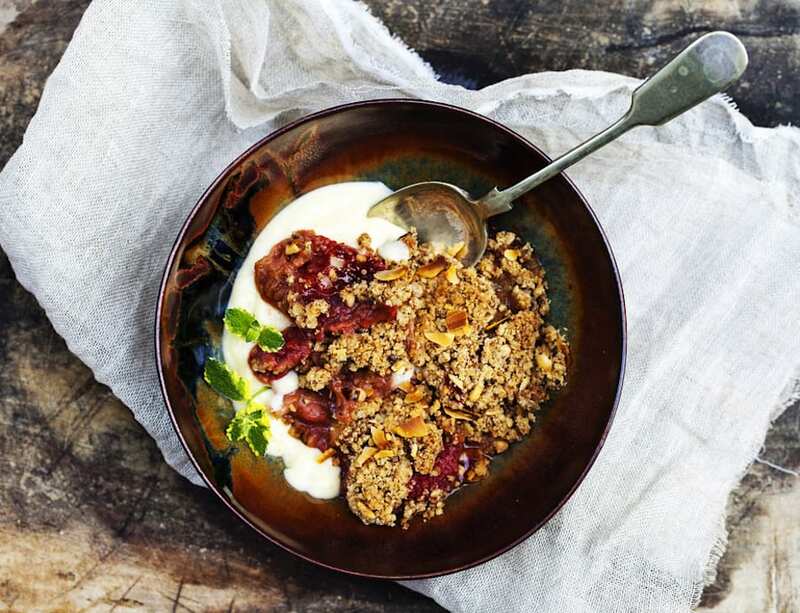 Combine yoghurt, tahini and reserved cranberry soaking liquid in a small bowl and season to taste. To serve, arrange rocket, sweet potato and apples on a large platter. Top with chickpeas and cranberries, then drizzle with yoghurt mixture. This makes the perfect starter or side dish alongside a hearty main. Cooking time: one hour and 30 minutes. To make the stuffing, place the coriander, coconut, chillies, garlic and ginger in a food processor and process until finely chopped. Stir in olive oil, lime juice and sugar. Set aside. Preheat oven to 220ºC. Rinse chicken and pat dry. Trying not to tear the skin, carefully slide your fingers underneath the breast skin to loosen down to the thigh area. Push stuffing under the skin and spread until it forms a thin layer over the breast meat. Tie the legs together with kitchen string. Place the chicken in a large roasting pan, breast side up. Drizzle with oil and season well. Roast for 20 minutes, then reduce the temperature to 200ºC. Roast for a further one hour and 15 minutes, basting occasionally, until the juices run clear when you prick the thickest part of the thigh. Remove from oven and rest for 10 minutes, loosely covered with foil. To make the gravy, remove fat from the pan juices until just the juices are left behind. Place pan over medium heat (if stove top safe). Add the curry paste and cook for two minutes or until fragrant. Stir in the coconut milk and simmer for four minutes until the sauce has thickened. Stir in the lime juice, fish sauce and sugar, and season to taste. Keep over a low heat until ready to serve. To serve, carve the chicken and divide amongst plates. Drizzle with the coconut gravy. Serve with lime wedges and steamed vegetables. 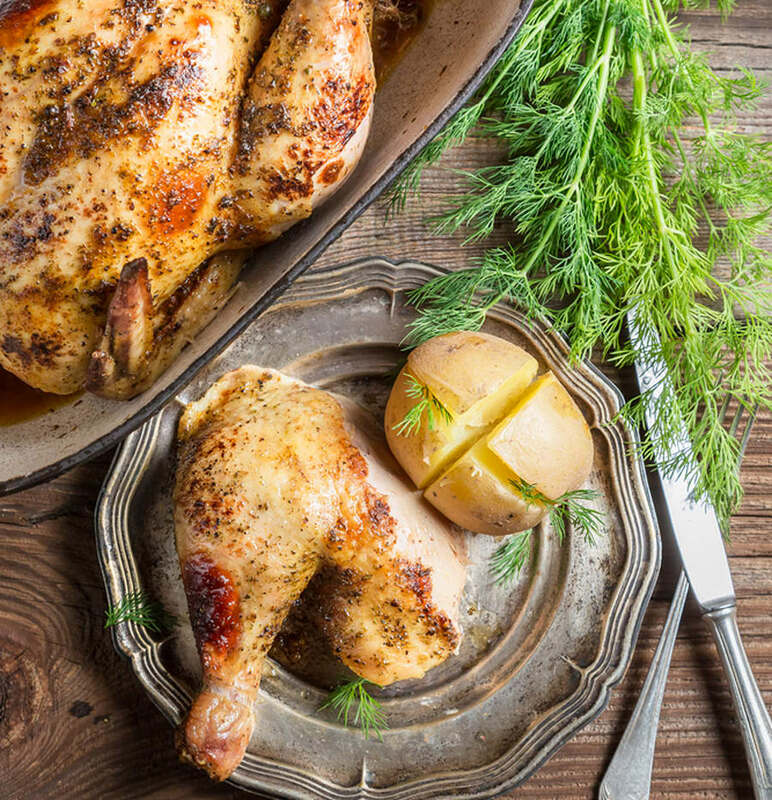 Mix up your regular Christmas roast and try this zesty recipe. Combine orange rind, orange juice, sugar, half the honey, mustard and garlic in a small saucepan over medium-high heat. Bring to the boil. Reduce heat to low. Simmer for 8-10 minutes or until reduced by half. Meanwhile, using a small and sharp knife, cut around the shank about 10cm from the end. Carefully run the knife under the rind, around the edge of the ham. Gently lift off the rind in one piece by running your fingers between the rind and the fat. Discard the rind. Use a small sharp knife to score the fat in a diamond pattern. Add a small amount of water to a roasting pan. Place the ham on a wire rack in the pan. Brush the ham with the pre-made syrup, reserving ¼ cup. 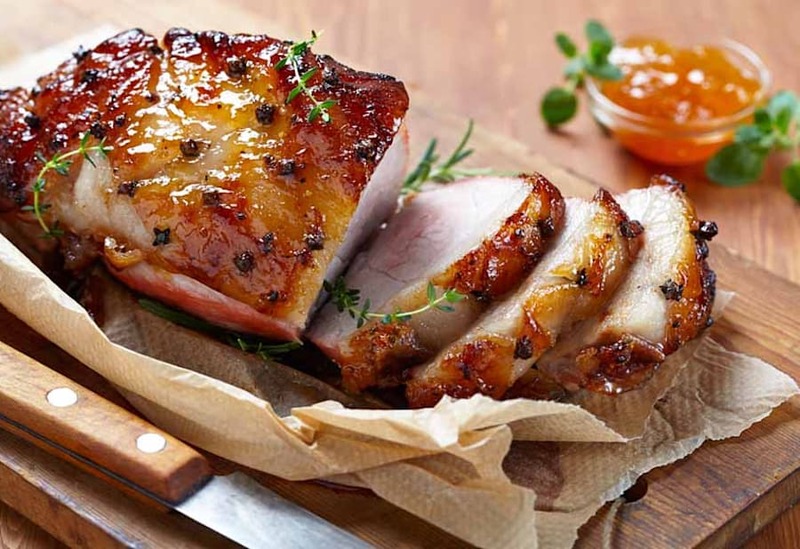 Bake the ham for 40 – 50 minutes or until golden brown (basting occasionally). Meanwhile, place nuts, all spice, salt flakes and pepper in a food processor. Process until finely chopped. Add reserved syrup and pulse until combined. Drizzle ham with half of the remaining honey. Press nut mixture over ham. Drizzle with remaining honey. Bake for a further 20-30 minutes or until nuts are golden. Set aside for 15 minutes to rest before carving. Perfect glazed ham in under two hours? Yes, please. Preheat oven to 180°C. Grease and line a 20cm x 20cm cake tin. Bring dates and orange juice to the boil in a small saucepan. Stir in bi-carb and remove from heat. Allow to cool. Beat sugar and butter until creamy and pale. Add eggs until well combined. Fold in flour, date mixture and vanilla essence. Pour mixture into greased and lined tin and bake for 30 minutes, or until golden and cooked through. To make sauce: bring all ingredients to the boil in a saucepan. Simmer for 2-3 minutes. Remove from heat. 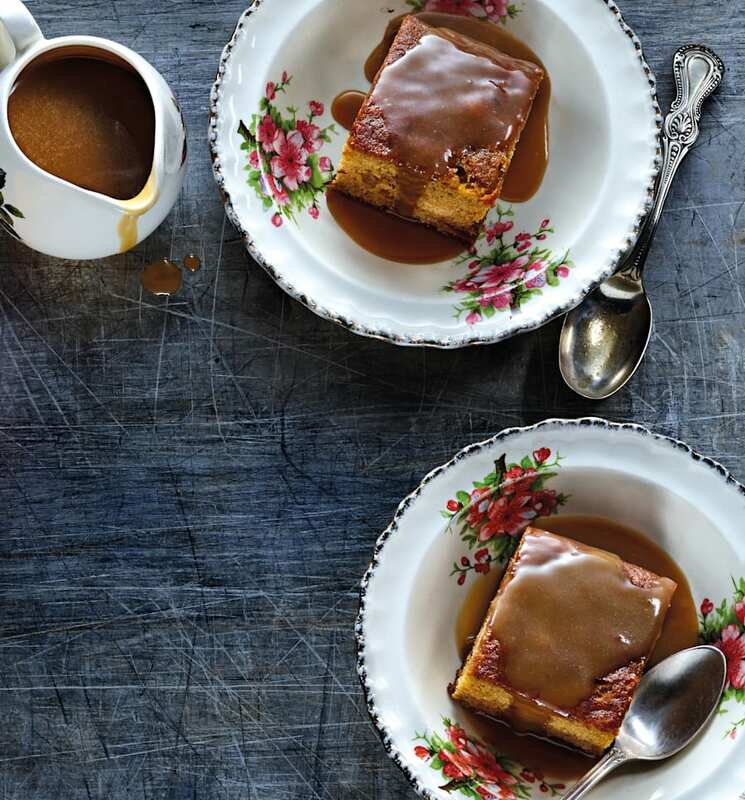 Serve warm pieces of sticky date pudding with warm caramel sauce. 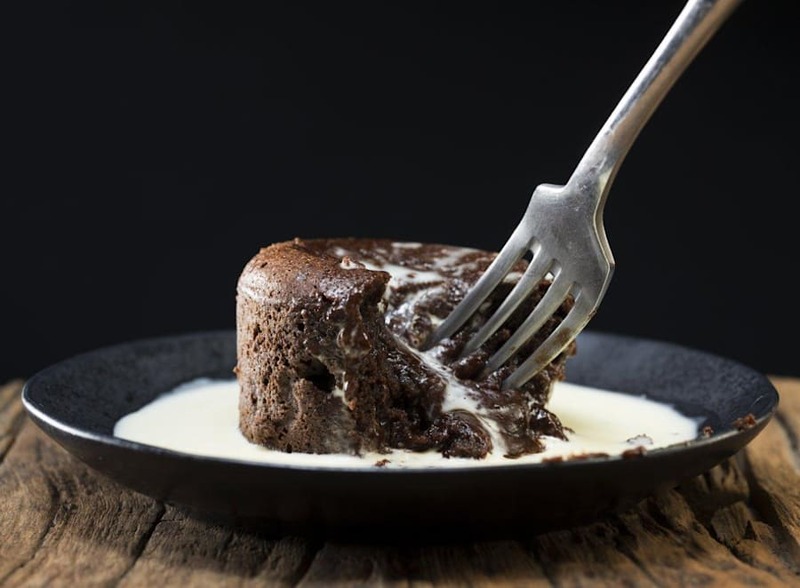 Tips: pudding and sauce can be made in advance and reheated in microwave prior to serving. For extra decadence, serve with vanilla ice cream. Preheat oven to 160ºC fan-forced. Grease a six cup capacity oven proof dish. Combine rhubarb, apple, caster sugar and two tablespoons of cold water in prepared dish. Cover with foil. Bake for 20-25 minutes, or until fruit is just tender. Meanwhile, sift flours and mixed spice into a bowl. Using fingertips, rub butter into flour mixture until mixture resembles breadcrumbs. Stir in oats, brown sugar, coconut and almonds. Remove and discard foil from fruit. Sprinkle with crumble mixture. Bake for a further 20-25 minutes or until crumble is golden. Serve with custard. Serve this crumble cold if it's a particularly hot Christmas day. Preheat oven to 190°C (170°C fan-forced). Heat dates and juice in a small saucepan until boiling. Remove from heat and set aside to cool. Meanwhile, place chocolate and butter in a microwave safe bowl and place in microwave for 30 second bursts on High, stirring in between until melted and smooth. Set aside to cool. Using electric beaters, beat the eggs, yolks and sugar until pale and doubled in volume. Add chocolate mixture, mixing until well combined. Fold in the flour, coconut, bi-carb and date mixture, and mix well. Spoon mixture between 6 x 250 ml capacity greased muffin pans. Bake for 12 minutes, or until just cooked. They will still be wobbly in the middle. Allow to sit for 3-4 minutes before turning out. Serve chocolate puddings with a good dollop of cream or scoop of ice cream and sprinkle with the toasted coconut. Recipes and images by McKenzie's Foods.